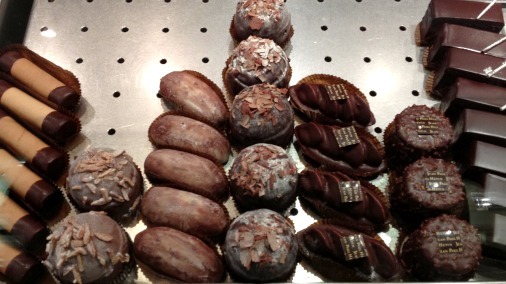 Just in case you were thinking I had wholly lost my heart to Italy I will prove my chocolate promiscuity here with a report on one of the best in Paris. In the smart environs of the boulevards of the first arrondissement, nestled alongside the smartest of Parisian boutiques, is the chicer than chic Rue St Honoré boutique of Jean Paul Hévin. It is a shrine to fine French chocolate, and there is a constant stream of the elegant and the in-the-know popping in for their cacao fix. The boutique front on the Rue St Honore. 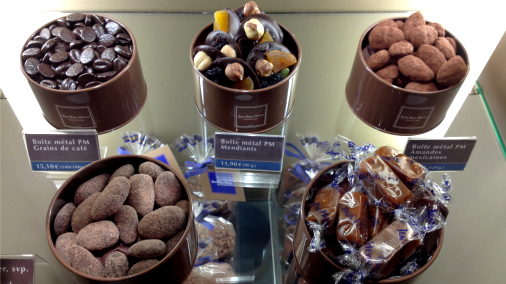 There are bonbons, ganaches and pralines to satisfy all tastes, patisseries to rival anywhere in Paris, and a comprehensive selection of origin specific bars for the more analytical chocophile. There is also something of the luxuriousness of a jewellers, as M. Hévin creates precious and somewhat whimsical items as special gift purchases. His solid chocolate stiletto is a case in point. I personally would have considered myself a very lucky Valentine to receive one of his elegant and quirky chocolate hearts. The ground floor interior of the boutique. The ground floor boutique is a serene blend of dark deep brown and dark blue with gold accents, the design modern enough not to detract from the main event, the chocolates, but classic enough not to be chilly. A beautiful display in the door showcases the main event. Mind you, Paris, and this stretch of road in particular, plays host to many chocolate shops, and many that have the top end design of the most exclusive fashion or jewellery boutique. 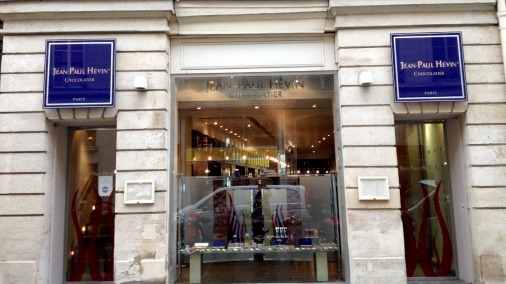 So what is to say that Jean Paul Hévin is worthy of particular attention? 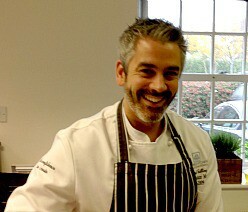 Why have I chosen him as one of my top Masters of French Chocolate? And you don’t have to take just my word for it, Jean Paul Hévin has been listed as one of the top eight in the world by chocolate expert Georges Bernadini in his magnum opus Der Schokoladentester. While the book is one man’s opinion, he does know his chocolate, and I would agree with many of his choices. 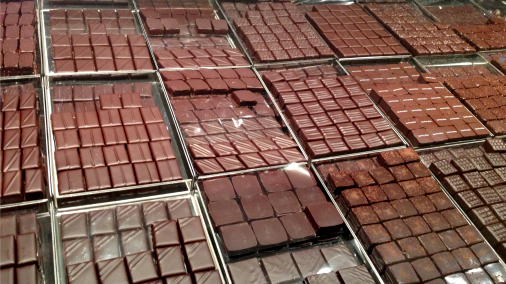 A beautiful array of ganaches from which to choose. In this case the proof is in the pudding, or in this case the chocolate. 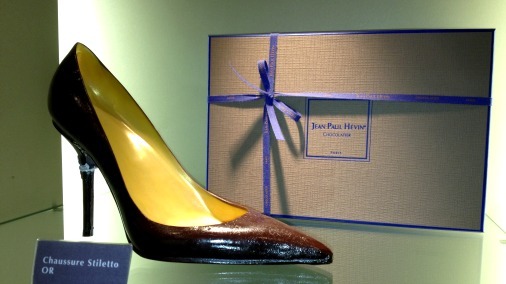 Jean Paul Hévin’s chocolates quite simply taste stunning and are made from the finest couverture, which cannot be said for the contents of all the chic chocolate boutiques jostling for attention. 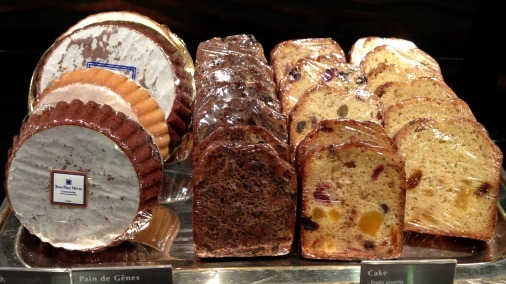 Despite being internationally celebrated M. Hévin still thinks like an artisan. He prefers to be in his atelier. He visits cacao growing countries every year to gain a greater understanding of the origins he is going to work with, and by the time he gets to the point of designing recipes for them he already has an understanding of their flavours. Once a recipe is nearing finalisation he insists on tasting it at four different points during the day. Chocolate for him is part of life, part of different moods and moments, and he wants to be sure it stands up to scrutiny under all circumstances. Unlike much French chocolate, or traditional chocolate from other key producing countries, he is dedicated to working with much less fat and sugar in his filled chocolates. The result is something with a lighter touch, easier to eat in many ways, as the purity of tastes is centre stage, without the same level of richness. 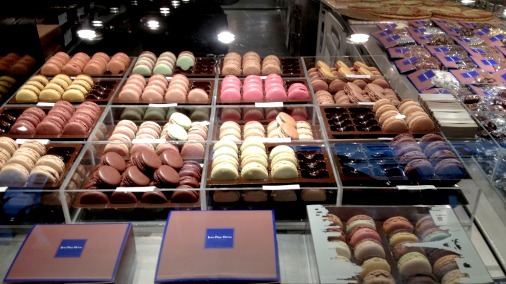 A selection of classic macarons. None of the chocolates I tasted was anything other than excellent. 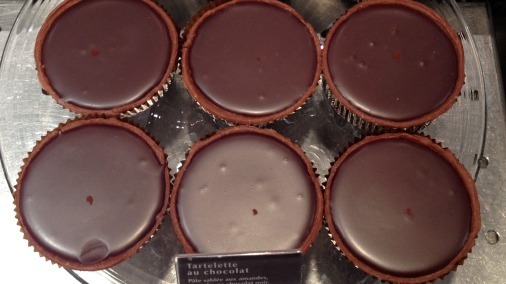 I was particularly delighted by Pomelo, a milk chocolate ganache married with exceptionally fresh grapefruit. 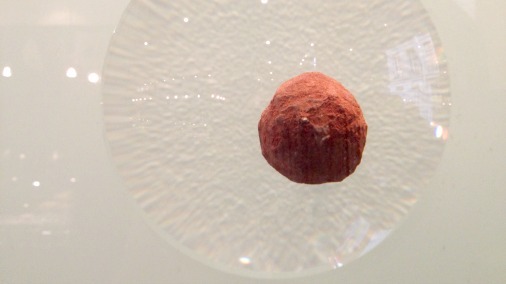 The sweetness of a full flavoured milk chocolate was a perfect foil for the almost bitter sharpness of the fruit. Taking the citrus theme in another direction Yuzu was a lemon dark chocolate ganache in which a burst of fruit from the cacao led into the fruitiness of the citrus. Yuzu has a glorious flavour that I might have compared to grapefruit if I hadn’t just tasted true grapefruit and noted how different this is. It is mellower and fragrant, but still very fresh. Mendiants and other goodies to take away. The Anapurna is a chestnut mousse in milk chocolate. Chestnut can be cloyingly sweet in traditional French baking, but this has been left nutty, and not overly so. It is the milk chocolate that supplies the sweetness and the lightly whipped chestnut retains some earthiness and delicacy. 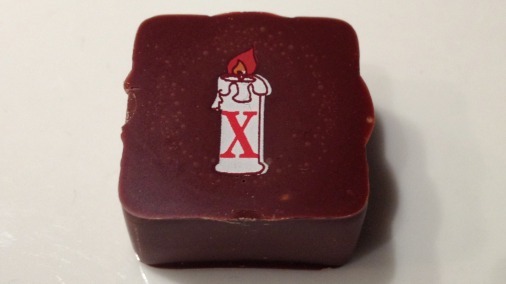 The very newest chocolate when I did my tasting, Le X, is a seasonal delight. It was freezing outside when I was there, and the darkly enrobed crisply textured and delicately spiced centre, redolent of toast and Christmas biscuits was nutty and delicate and hit the spot perfectly. 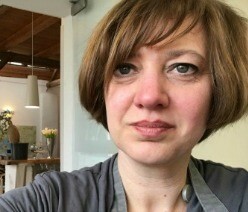 The last chocolate I tried on this occasion was Zenzero, a refined but gutsy pairing of dark chocolate and fresh ginger. The clean, smooth ganache was intense in flavour, marrying the fruity fresh notes of ginger with a suitably intense cocoa. It is hard to find a good chocolate with ginger, a spice I love when it is treated with intelligence. This is a really fine result, and has a beautifully long aftertaste of mellow smoky cacao. The elegant upstairs hot chocolate bar. If you need any more convincing that this glorious centre of chocolate excellence should be on your list of must-visit destinations of choice then I have saved (almost) the best till last. 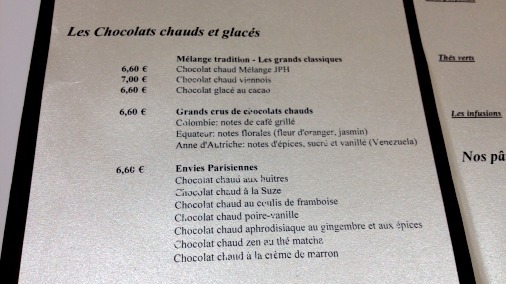 The hot chocolate menu at the Rue St Honore. 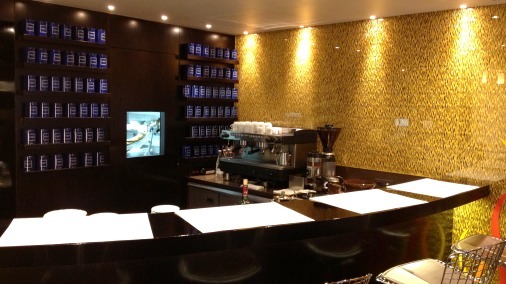 Rue St Honoré boasts an upstairs café, which is home to a stunning array of chocolat chaud. 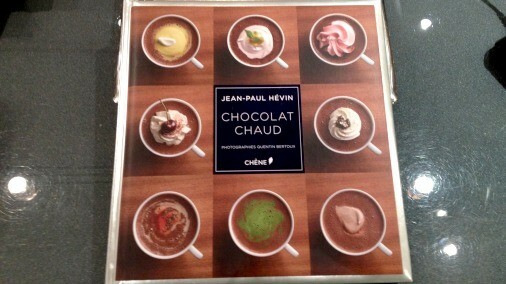 M. Hévin is nothing if not serious about hot chocolate, having written a whole book on the subject. 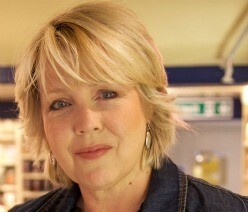 He has many recipes, incorporating different flavours depending on the time of day or your need on drinking it. There is even one with oysters, apparently a wonderful pick me up for the start of the day. The creation of my wonderful hot chocolate. 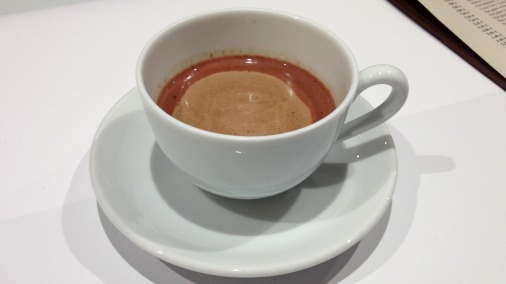 In the spirit of research, and given I was in the ‘city of love’, I tasted the “Chocolat chaud aphrodisiaque au gingembre et aux épices”. 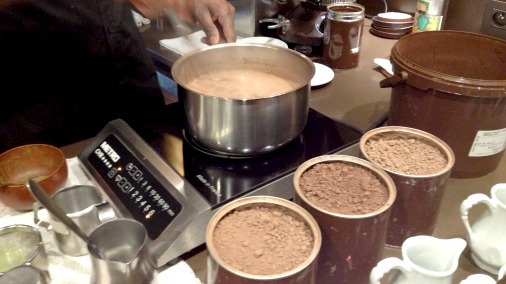 All the chocolats chauds are made with whole milk and the unsweetened cocoa powder used exclusively by M. Hévin. With the aroma of fresh ginger wrapping itself around me and shutting out the snowy day outside I found it truly delicious. It made a change from much gourmet hot chocolate around, in that it was noticeably less rich and sweet, and therefore more effectively a pick-me-up. I find the richer stuff can sometimes be a drag-me-down. It certainly had the stimulating intensity of flavour to be the perfect fuel for a romantic encounter. 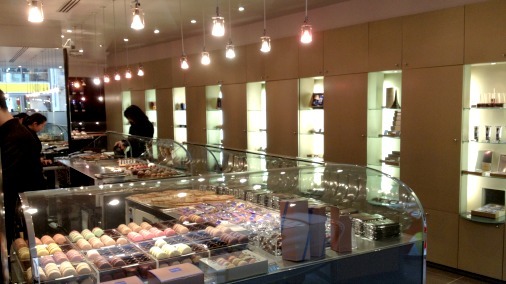 Life can’t help but feel pretty buoyed up by such fine chocolate in such an elegant corner of the Rue St Honoré. NB: A version of this article first appeared on Girl’s Guide to Paris.